We have new evidence that the presence of federally-certified Rural Health Clinics (RHCs) is associated with greater primary care appointment availability in rural areas, thanks to a new paper in Health Services Research (early view). In a new analysis of “secret shopper” data, Michael Richards and colleagues from LDI and Urban Institute find that RHCs are especially important because they grant appointments to Medicaid patients at the same rate as private-pay patients. This should come as no surprise, because RHCs are paid using a prospective payment system (or with alternate payment models) that are higher than standard Medicaid rates. For those unfamiliar with Rural Health Clinics, more details are here. CMS established this special health clinic certification to provide advantageous Medicare and Medicaid reimbursement as a strategy to increase access to primary care services in rural areas. 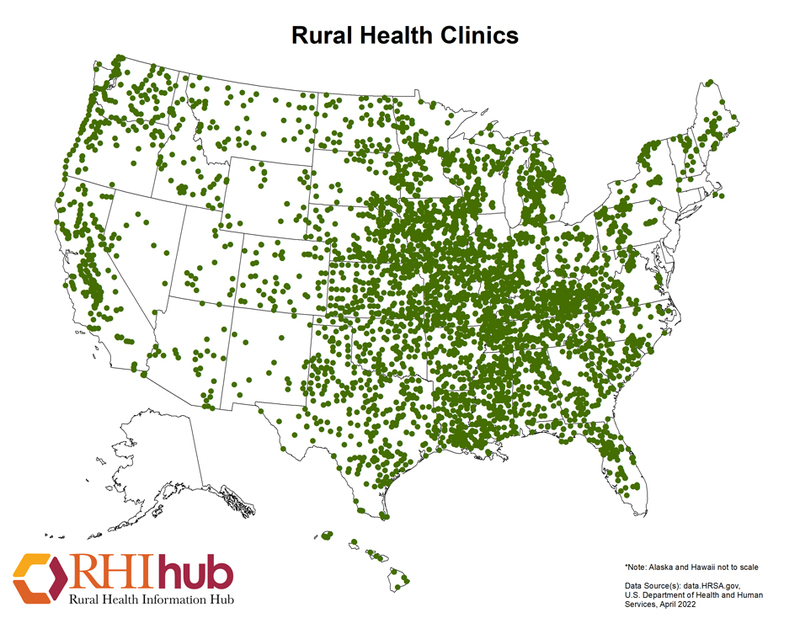 Although the RHC program was established in 1977, and RHCs now number more than 4,000 (see map here), we have not had strong evidence that they are fulfilling their function of addressing rural access issues for Medicaid patients. Until now. Richards and colleagues use data from the first wave of a secret shopper, or audit study, conducted in 2012-2013 (prior to the major ACA expansion). We’ve described the parent study before: to repeat, trained research assistants called a representative sample of providers in 10 states posing as patients requesting a new patient visit. The callers were randomized to say they had different insurance types (private, Medicaid, or self-pay). The design allowed the researchers to simulate the actual appointment availability for new patients seeking care, and to isolate the effect of insurance status from other factors that might influence appointment rates. For context, first the authors use their data to show how new patient appointments differ between rural and nonrural areas. About 80% of Medicaid callers receive an appointment in rural areas—a rate more than 20 percentage points greater than nonrural areas. After adjusting for clinic and location factors, Richards and colleagues find that rural and nonrural practices offer appointments to private and self-pay patients at similar levels, but large differences for Medicaid patients remain. The authors then turn to investigate the role of Rural Health Clinics by comparing appointment availability across clinic types and insurance status within rural areas. As shown, appointment rates are similar across clinic types for self-pay and private patients. However, RHCs grant new Medicaid patients an appointment at greater rates (nearly 95% of the time) than other rural practices (less than 75% of the time). Even after adjusting for other factors, RHCs are associated with a 19 percentage point increase in the likelihood of a Medicaid caller getting an appointment. The supply of new patient appointments in rural areas appears influenced by the presence of RHCs, and RHCs grant appointments for Medicaid callers at rates on par with the privately insured. The RHC to non-RHC differential in Medicaid rates also emerges despite almost all rural practices having Medicaid in their payer mix at baseline…Thus, RHC status seems most correlated with practices’ intensive margin decisions (i.e., the willingness to expand their Medicaid patient panel further)—as opposed to the extensive margin (i.e., participating in Medicaid at all). One interpretation is that RHCs’ cost-based reimbursement—and plausibly more favorable Medicaid prices—eliminates any supply-side preference for the privately insured. This analysis used data from the first wave of calls, conducted prior to the 2014 ACA coverage expansion; recently, the same study team used a second wave of calls to demonstrate that the now-expired Medicaid fee bump improved the availability of new primary care appointments. In effect, RHCs have been operating with bumped up fees for Medicaid (and Medicare) since 1977. We don’t know precisely how much more the RHCs are reimbursed, because states vary in the payment mechanisms they use in the program. But the program serves as a model for increasing access for Medicaid patients through permanent provider financial incentives. Similarly, RHCs may also serve as a model for team-based care in alternate delivery models encouraged by the ACA. A requirement for RHC certification is that practices must be staffed at least 50% of the time by non-physician providers such as nurse-practitioners, physician assistants, or certified nurse-midwives. That makes sense because RHCs are located in health professional shortage areas. But more generally, we may learn a lot by studying the successful interprofessional collaboration embodied by the RHCs for nearly 30 years. The study team includes Michael Richards, Brendan Saloner, Genevieve Kenney, Karin Rhodes, and Dan Polsky.